Architect Frank Gehry has again revised plans for the towering complex opposite his Walt Disney Concert Hall in Los Angeles, which will finally begin construction this autumn. The Grand development will include multiple buildings across a three-acre (1.2-hectare) site in the city's Downtown area, on a lot currently occupied by a parking garage. The design of the complex has been through several iterations since Gehry's original plans were rejected back in 2006. Planned to include 209,000 square feet (19,400 square metres) of floor space, the project comprises irregularly stacked boxes that form tiered towers either side of a plaza. A hotel, restaurants, shops, a movie theatre and residential units will all be housed within the buildings. 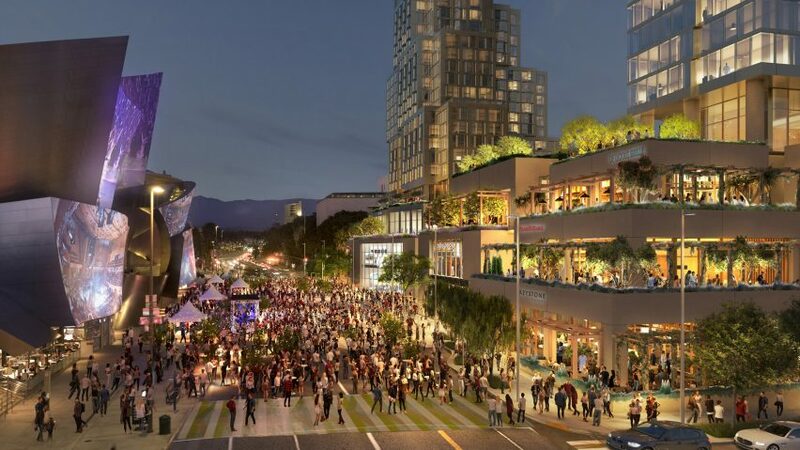 The large pedestrian area between the structures will link the complex to the Walt Disney Concert Hall on the opposite side of Grand Avenue, which was also designed by Gehry and opened in 2003. The performance venue's silvery curvaceous facade will be projected on to from The Grand, fulfilling an original intention of the architect's. The Grand will be built by international engineering firm AECOM, and managed by real estate firm Related Companies, headquartered in New York City. The project will include one of the first hotels by fitness brand Equinox, which will feature 314 rooms and occupy 20 storeys of the smaller tower. Equinox is also planning a hotel at New York City's Hudson Yards. The taller building will be residential on its upper levels, with 436 homes spread across its 39 storeys. Related Companies has partnered with CCCG Overseas Real Estate (CORE) for the next phases of The Grand, and announced that construction it set to commence in fall 2018. Gehry, who lives in nearby Santa Monica, is working on several projects in the greater Los Angeles area. He recently updated his plans for a development in his home city, and has proposed a development on the famous Sunset Strip. The architect was also chosen to masterplan the revitalisation of the LA River – a concrete channel that snakes through the city.